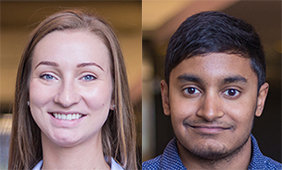 The Teaching Assistant Graduate Student Advancement (TAGSA) Executive Committee is pleased to announce the 2017 recipients of the TAGSA Award for Best Conference Session Led by a Graduate Student: Alyona Koulanova and Aryel Maharaj, Masters students from the University of Toronto Scarborough. Aryel is currently completing the M.Ed. in Counselling and Psychotherapy at the Ontario Institute for Studies in Education and Alyona the M.Sc. in Exercise Science at the Faculty of Kinesiology and Physical Education. At the recent STLHE conference in Halifax, Alyona and Aryel co-presented the session titled, “Fit-Breaks: A Physical Activity-Based Intervention for the University Classroom” (please see the full abstract below). They have been contributing to the Healthy Campus Initiative at the University of Toronto Scarborough (UTSC) by creating the Fit-Breaks program, which has been implemented across several academic departments. Promoting healthy-active-living through this actionable program has led to a research project which resulted in the conference presentation. Through this project, they have focused on implementation of classroom interventions: working with the student population to decrease stress and sedentary behavior to promote well-being, life balance, and academic performance. All adjudicators agreed on the clarity, cohesion and engagement in the session. One adjudicator who attended their session stated the following: “This wasn’t a spur-of-the-moment thing but a well-determined project. Audience wanted to know more – a very good sign!” Another adjudicator simply summarized it as a “remarkable contribution”. You can read more about the presentation, the roots of the research project, and the presenters’ personal reflections in a blog post on the TAGSA website. The award recipients were announced at the closing of the STLHE conference. The award which is sponsored by the STLHE and the conference organizers at Dalhousie University and Saint Mary’s University, includes a certificate, reimbursement of all conference registration fees, acknowledgement on the STLHE website and in the STLHE newsletter, a one-year complimentary membership to TAGSA, and a one-year complimentary membership to STLHE to recognize the contribution Alyona and Aryle have made to teaching and learning in post-secondary education. Congratulations! Thank you to STLHE and this year’s conference organizers, Dalhousie University and Saint Mary’s University, for their generous support of TAGSA and this award! A common practice at many post-secondary institutions is to take short breaks during longer lectures to allow students time to relax, collect their thoughts, and “stretch their legs”. However, in many modern lectures a majority of students remain seated during this time, using a laptop or mobile device. This prevents the physical and cognitive break that is necessary to regain focus and reduce stress. In this session, we introduce the concept of a “Fit-Break”: A short burst of easy-to-follow exercises and stretches carried out during the normal lecture break. We will then discuss our use of FitBreaks in first year courses, and provide the resulting data. The introduction of these simple physical activities during the normal lecture schedule is an easy way to improve student focus, reduce stress, promote retention, and provide students with a healthier, more pleasant academic environment.